This tutorial covers the process of resetting the password for the admin area of your Joomla website directly via phpMyAdmin service. This may be required if you have forgotten the password for your website, for example. To start with, get the name of the database set on your website. You can review this information via the main configuration file of your Joomla website. For more information on the main configuration file and the information it holds, review our tutorial on How to locate and use the main configuration file of Joomla. The next step is to access the phpMyAdmin service within your cPanel account. It allows you to review the database set on your website and manipulate it as per your needs. 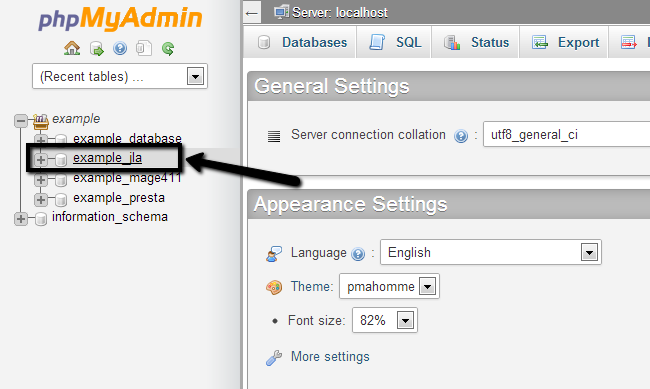 To do this, log into your cPanel account, locate the Databases section and click on the phpMyAdmin service. Select the database that you wish to edit. It is located on the left-side of the screen. Once you access the database on your website via the phpMyAdmin service, you can proceed further with the password reset. To do so, you have to locate the prefix_users table. The prefix part will differ amongst the different websites that you are asked to set during the installation of your Joomla website. In our example, this is set to weiog, which means that the name of our table is weiog_users. When you locate the table in question, simply click on its name or the Browse button next to it. This will bring up all the information within that table and it will give you the possibility to edit it. 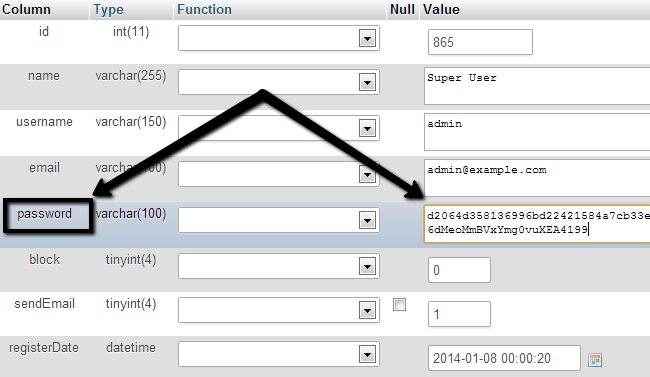 Then locate the admin user on your website which is normally set to admin. Click on the Edit button next to the admin user on your website. Now, the next step will actually change the password for the admin user on your website. The important thing to know here is that the password is encrypted. This means that it will not be a human-readable password, but a string of symbols, which represents your password, using complex encryption algorithms. Locate the password row on the new page and enter the following string within the Value field on it. When you are ready, simply click on the Go button at the bottom of the page in order to keep the changes. You are all done. The password for the administrative area of your Joomla website is now set to the word secret. We strongly advise you to change it immeaditely from the Control Panel in your Joomla website, following the steps in our tutorial here.